Here's my entry for the Curtain Call Challenge which is Simplicity. Stamps are from Penny Black's Butterfly Party and Stampin' Up! Trust God. I love the Penny Black set because there are 3 tag stamps in the package. Each is a little different butterfly on a different background. 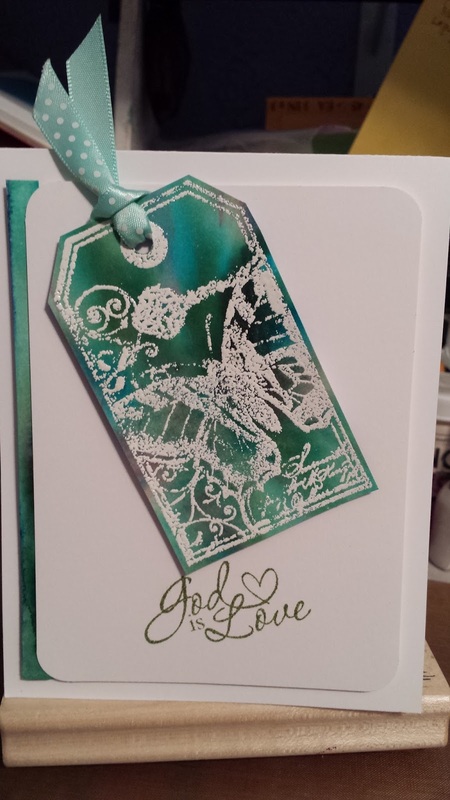 The sentiments from this Stampin' Up! set just really fit when it's time for a little spiritual inspiration. To me butterflies are calming and the sentiments in the Trust God set, go so well with them. My tag was stamped with Versa Mark onto a scrap of Brusho I made several months ago. Heated some white embossing powder. So a "found object" makes this one pds (pretty darn simple)!